A SLOWER PACE OF LIFE? YOU’VE GOT TO BE KIDDING! I seem to utter these phrases several times a day, or perhaps I am just trying to convince myself, but I do know that we really will have more time on our hands soon; I really do hope so. Right now, I feel as if I am being pulled in every direction. The weather is beautiful, with long hot sunny days and it’s not getting dark until well after 10pm. This has a downside though, as we are working until well past 10pm each and every day. We’re up against a few deadlines and nothing bar nothing seems to be going our way at the moment. 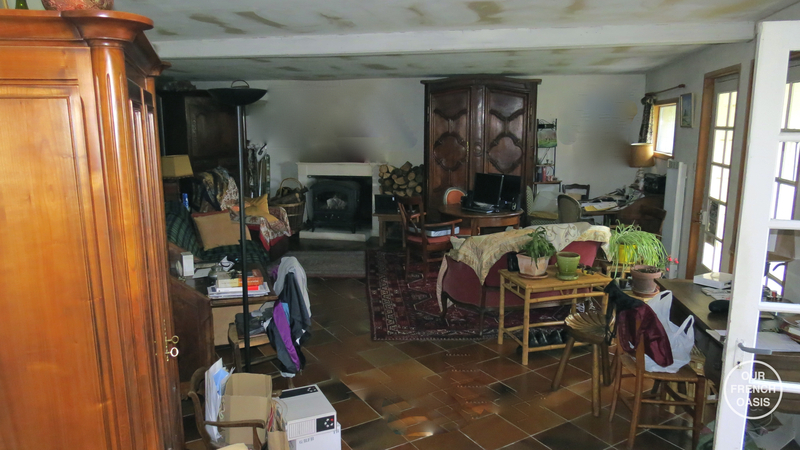 Our guest house has a deadline and we are frantically trying to get it finished, but it seems to be a case of one step forward and two back as we hit problem after problem; below is a little glimpse of what it looked like when we bought the house, and what it has gradually turned into. The pool is still not finished as it has also suffered a few setbacks. Arguing with customer relations on the phone is not my forte in French, and even Roddy struggled to break down the obstinate defenses of the seasoned pool shop campaigner who fielded his questions and demands with an increasingly frightening use of French terms which seemed to have no direct English translation. Jack finished school this week on Tuesday and has been reveling in not having to get up at the crack of dawn any more. Millie finished last Friday, but returns to school today and tomorrow for her Brevet exams which I’ll explain later; this has been a revision week at home for her. The two youngest girls still have another week much to their annoyance, but it’s hardly doom and gloom, they have their big school fête to look forward to at which I thoughtfully volunteered Roddy to run the barbecue! There are dance performances, games and singing, and with much practicing replacing standard lessons at school the excitement is building amongst all the little ones. They also have a day out touring the marsh in the Marais on their bicycles next week and it should be a fabulously novel school trip. This morning they went to school on their bikes as they were spending a good part of the day going over road safety, safe bike handling and so on. Of course, when you’re 8 or 10, this isn’t boring – this is super-exciting stuff; in fact anything that detracts from normal lessons is super-exciting, at least that’s how it was in my day and I think that is one of the few things that hasn’t changed! Roddy trundled down the road with two children, two bikes, two large school satchels, helmets and various other accoutrements, muttering under his breath about Don Quixote, donkeys, and windmills. I rather think his foot suddenly developed a limp again just for the spectators. What is also exciting for us is the fact that Izzi is home from University for the summer; it’s fabulous to have all five of the children together again and it’s just plain NICE to have her home. She has taken over the role of head-cook and part-time housekeeper whilst we live in this temporary whirlwind of deadlines, and in turn this allows me to get bitten late at night in the garden by mosquitos as I deadhead, weed and water. The bats whirring sibilantly around my head are very much my friends in reality, of course, but I have to worry about them too, I have had a fear of bats ever since I watched a highly unsuitable horror movie when I was a teenager. Roddy confidently announced we had two species in the garden, and surprised at his knowledge, I asked which sort – the answer was typical and to the point – ‘big ones and little ones’. Amidst the chaos of the last week, it turns out that our four Faverol chicks appear to be three males and one female – which is not the result we had wanted! As I had promised our neighbour’s son, who also happens to be best friend with the girls, a female and a male chick, I wasn’t going to go back on my promise. 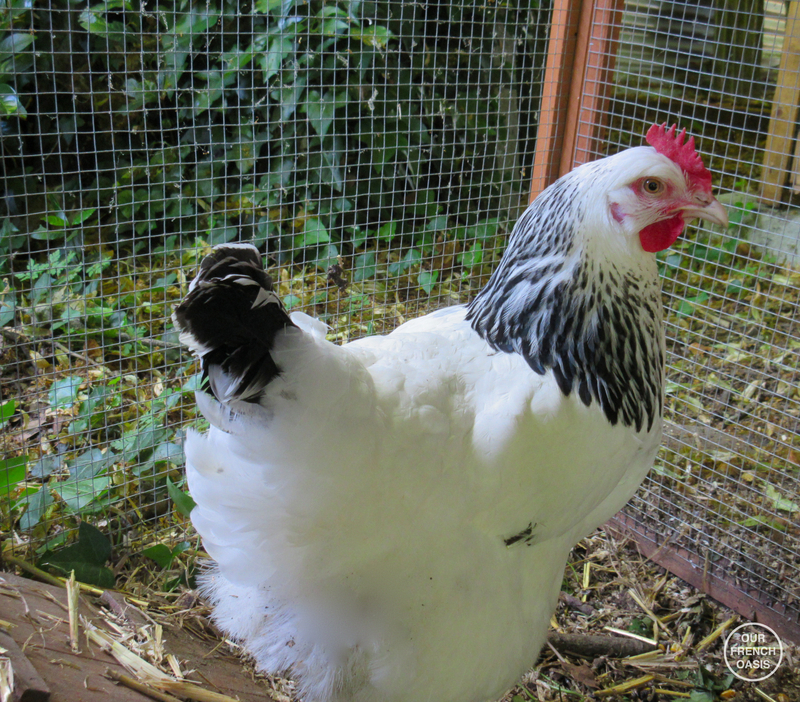 So we have advertised the other two males for sale as we cannot keep another rooster; it would be much bigger than our dear bantam rooster, Fritz, and would no doubt beat him up quite severely with so few females to go around. Roddy did mention that we had some perfectly good casserole dishes and a bottle or two of good red wine which could be used to rectify the situation, but this has appalled the children who vehemently stated they were going to a good home instead. As a result, however, I was persuaded (although it took very little persuading, to be frank), to purchase two new laying-hens. 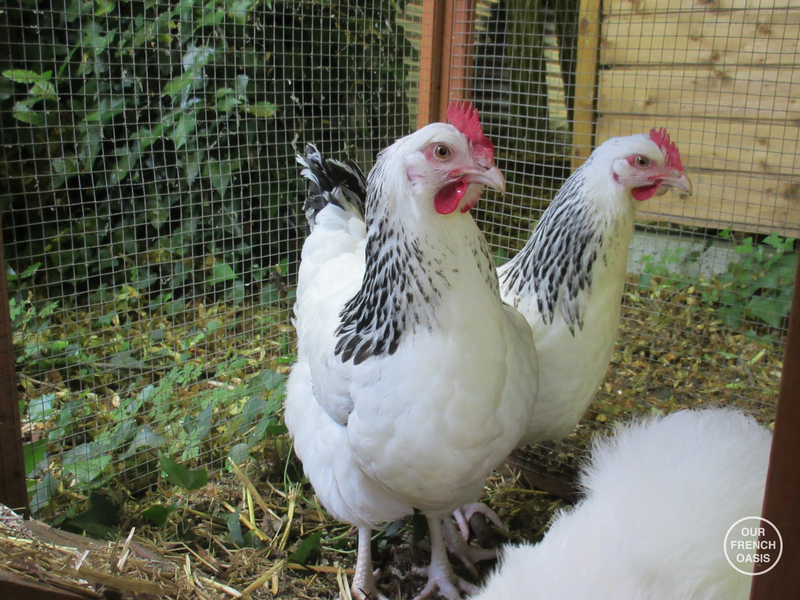 So we now have two beautiful white Sussex hens; Églantine and Astrid – regal speckled-white ladies amongst the shadows under the lime trees. Along the way when my back was turned Millie also managed to squeeze a young female white Silkie into the hen basket at the same time, whom she has named Constance. 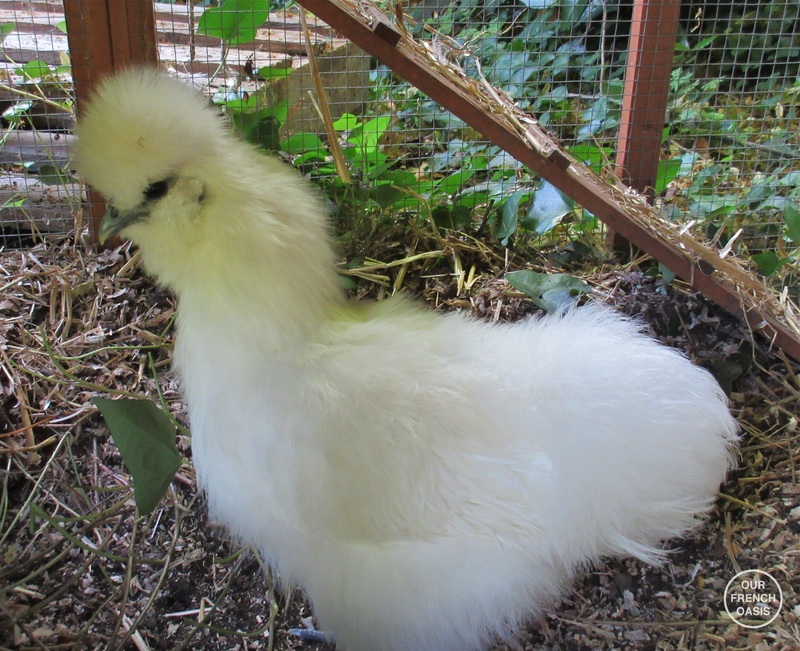 She has been wanting a Silkie for five years, and her dream has finally been fulfilled. We had to trim the feathers around her eyes yesterday and I can see she is going to be the pampered pooch of the hen house! Roddy stomped his feet at first and then muttered that Constance looked a little like a poodle! “What ????? ?” she wailed, “You cannot be serious ???? OMG !!! I have to have it, I have to have a piece of official identity with a photo, nothing else will count, Mama my life is finished, I won’t be able to take my Brevet – Mama how can you have sent it away, Mama…” I felt about as small and useless as a snail, but right then I didn’t have any other answer, which really wasn’t helpful in placating a distraught 15 year old who truly believed she would now not be able to take her Brevet. I’d best explain a little. The Brevet in France is similar to GSCE exams in the UK; they are taken in several subjects at the end of College (MIddle School), and most children are usually 15 when they take their Brevet. Some leave school for good after this, for others it is the exams that decide if they are able to move on to Lycée (High School), but there are only three years of Lycée and four years of College here. The exams are sat right the way across France on the same days at the same time, by millions of pupils. During the past couple of months they have sat several mock exams (the Brevet Blanc) but now everything comes down to two days. I phoned Roddy who was not at home to ask him what we should do, although he had no clue either. Just as I was preparing to ring the school and beg, plead, grovel (this was not a time for pride), Roddy called me back. Rather sheepishly he told me he had found an envelope on the dashboard of his car, and in it was the said passport which was meant to be on it’s way to the UK and Her Majesty’s Passport Office for renewal. He had completely forgotten to go to the post office with it on Monday when I had given it to him. Never again will I swear at my husband for forgetting to mail a letter; it’s true there have been other occasions when I have taken his car and found a letter sitting on the passenger seat under a long-forgotten coat which I had assumed had long ago reached it’s destination; and there have been occasions, I have to admit, when I have been more than just a little annoyed (with maybe even the odd swear word uttered), but never ever again will this happen – for this time he has truly saved my bacon. Peace has been restored and I did not have to grovel and beg at all! So to any readers from France who have children taking their Brevet today and tomorrow I wish them the very best of luck, or as a French lady said to me yesterday, we don’t say good luck to someone we say Merde! In the meantime Izzi and I are off to Bordeaux today to collect her best friend who is visiting France for the first time ever, now if only I can find the time to show her around! Meanwhile I am still dreaming of those long lazy summer days reading a book under the shade of a tree, drink in hand and the occasional dip in the pool when it gets too warm – sigh, we will have more time soon! ← GARDENER, HOUSEKEEPER AND CHAUFFEUR NEEDED AND WANTED! Goodness me, what stress. We have had the Bac these last few weeks and every day I have yelled out…”have you got your convocation”, “have you got your passport”, to which the instant reply every day was…”driving license wil do, mum”, It sounds like you need to get all those lovely kids of yours on a scooter stage, one full day and then they get sent an official license for driving a scooter, and you can use that instead. Your writing really makes me snort out loud with laughter – particularly Don Quixote and the windmills! 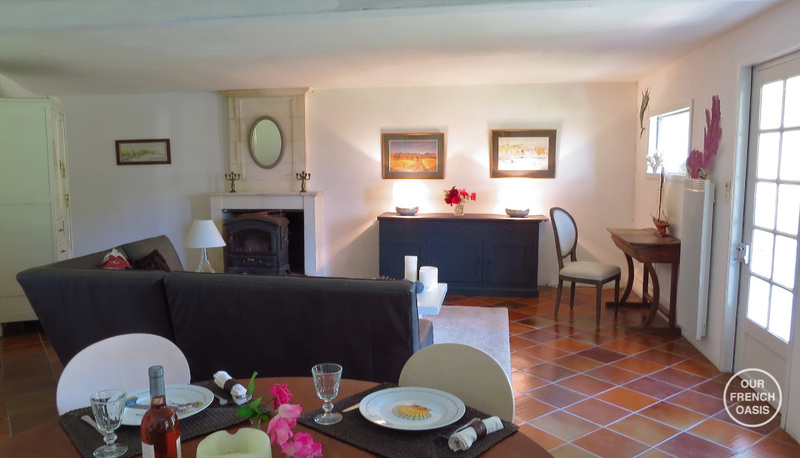 Have fun in the pool, maybe delaying completion of the gite woud be a good idea, more private pool time all for you!! My, you certainly are busy. Do take the time to enjoy the days. They fly by so quickly. I loved your husband’s comments about the two kinds of bats. I am scared to death of bats so hope not too see too many around my garden. Keep cool in the next few days. Wine tasting. Sounds like a fun day. Be sure to taste some Pecharmant, it was a new find for me a few months ago and I was quite impressed. Next time you are in the area you must stop in and visit. Unfortunately my furniture only arrives in 3 weeks so I cannot do it this time but next time, I will be sure to see you all for lunch. In the midst of chaos it is hard to think of a time to come when peace will descend, but it will. One minute it seems that every minute of every day is filled with taking care of the needs of the children, and then suddenly (or not so suddenly) they are grown and off to live their lives. The house is quiet. Rooms that were once filled with activity go untouched. You will be able to find the scissors; the keys will be where you left them (if you can remember where…). 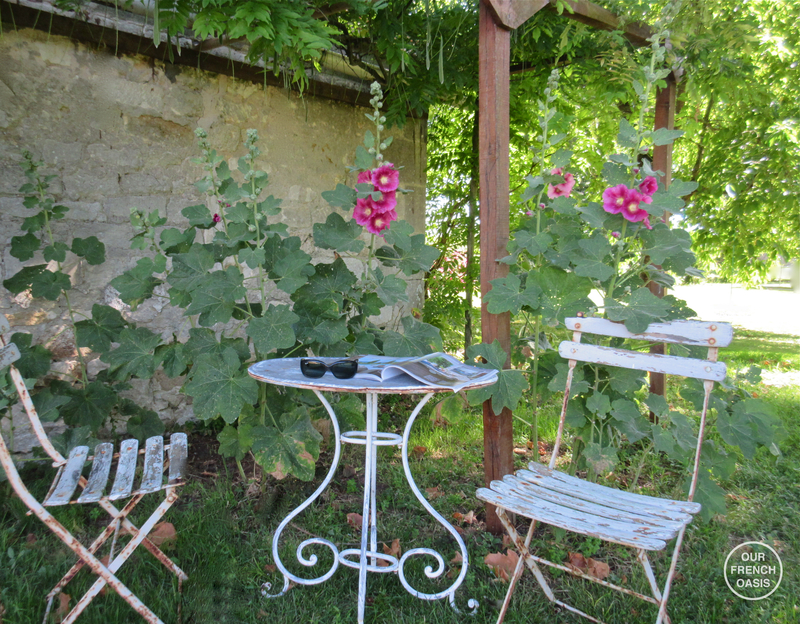 And there will be time to enjoy a glass of wine as you sit in the garden. Time to ponder the change of seasons…not only of the garden, but life itself. 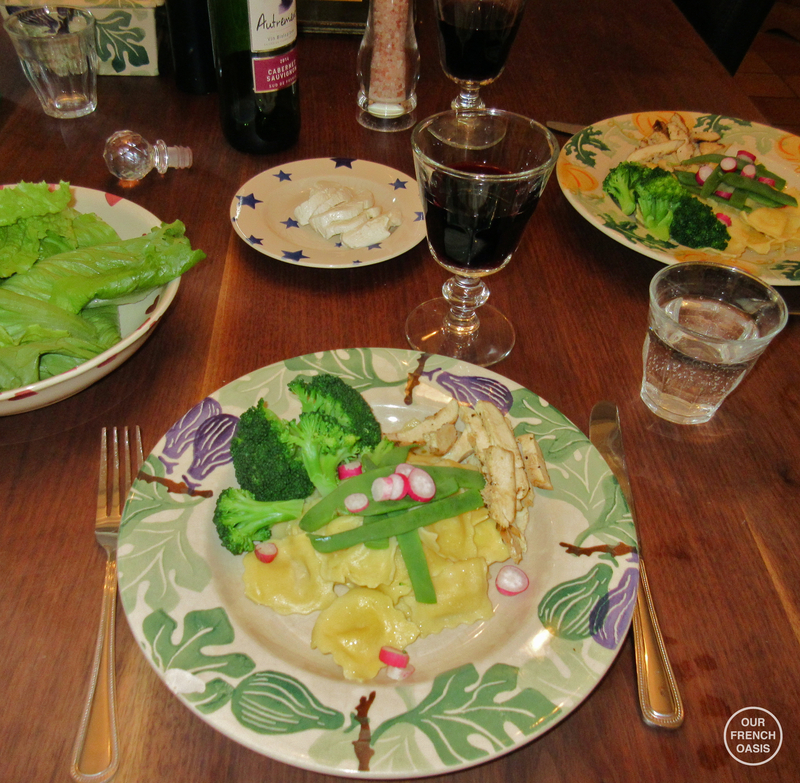 Again Sue a fab blog. Just loving reading it. I can so identify with all your problems especially your Pool. After 15 years I have constant problems with my customer relationship with the pool people which are zero!! Good luck. Your renovations look amazing. Good luck with everything but I guess the pluses outweigh the minuses?!! HYSTERICAL……………………THAT SLOW TIME will come soon enough! Ha ha, but then I’d be bored!! !